In an effort to showcase Idaho farmers and their bounty, our farmers are encouraged to participate in the “Farming for Rehab” campaign. The effort is really quite simple: Donate profits from one acre of crop a year to Idaho Elks Rehab. 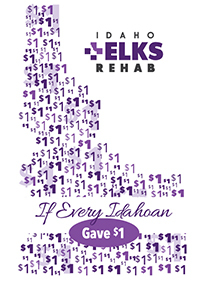 Idaho Elks Rehab funds rehab across the state. “Farming for Rehab” provides an opportunity for farmers all across Idaho to come together to make a huge impact. The collective efforts of farmers of all kinds could make a huge difference in the lives of fellow Idahoans in need of rehab. The “Farming for Rehab” campaign could serve as a catalyst for other occupations in Idaho. Farmers could set the stage for a statewide show of support for rehab. Can we count on your participation? Simply complete and return the pledge form or contact Grant Jones, Director of Development, at (208) 489-4592 or grant@idahoelksrehab.org. What if every Idahoan gave $1? If everyone in Idaho gave just $1, we could invest $1.6 million for rehab in our state. In our lifetimes, we will all know many people who need rehabilitation of some kind—let’s be sure they have the best there is! A personalized brick is a perfect way to recognize that special person in your life and support Idaho Elks Rehab. Bricks are ideal to recognize special occasions and milestones, honor loved ones, memorials, and for that that hard-to-buy-for person. Just $50 buys a commemorative brick, and $35 buys a replica brick for display. Bricks are placed near the elk statue at the front entrance of the Idaho Elks Rehab Medical Building 1 (former Elks Rehab Hospital). To purchase a brick, please contact Grant Jones, Director of Development, at (208) 489-4592 or grant@idahoelksrehab.org, or submit this order form. There is a new focus and brand for the Major Project of the Idaho State Elks Association. The organization that has operated healthcare facilities specializing in rehabilitation for decades has transitioned to a philanthropic endeavor focused on funding rehab in Idaho.